Can you believe Vietnam population is among the top countries in the world? Well, that’s true. Though my country has a modest area of 331,210 square kilometers (127,881 sq mile – ranking 66th in the world), yet has about 90 million people, ranking the 13th populous nation worldwide. Let’s make some comparison. Two other countries with more or less area, Finland has only about 5,4million population, and Malaysia has roughly 30 million. Many inhabitants on small area result to high population density, which is 260 people per square kilometers in Vietnam, as of 2012. That figure nearly doubles that of China (140) and six times of worldwide average (48). Also, in 2013 Vietnamese has doubled the population (about 90 million) in comparison with 1970 (about 45 million). Isn’t it too fast for only 43 years? I believe so. Frankly, those figures are not what I’m should be proud of, really? My country is just a developing but crowed country. Anyway, the figures show that we have a plentiful labor source and a considerable potential to do something for the planet, if we’re on the right track, which I hope we are. 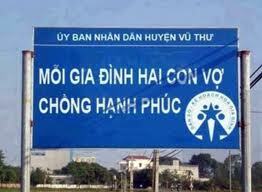 Vietnamese concerned authorities have applied various methods to curb population growth. I still remember many propaganda slogans applied since I was a little boy, such as “Each family has only one to two children”, or “Cease at 2 children to raise them well”, etc. Each family having two wives, the husband is happy. With population control policies including administrative punishment sometimes, Vietnamese authorities actively control the increase. But so far, there’re still many adverse affects, such as problems of unemployment, housing and environmental pollution due to crowded national population. Maybe due to crowed population, my nation has a narrow land per capita. That’s why price of real estate is really exorbitant here. On Asian-wide average, price of house is about as many as 5-6 times of GDP per capita. Yet, in Vietnam, the ratio is over 20. Can you believe that we need over 20 years working consecutively to buy private accommodation? It’s a long time really. So if foreigners want to buy a house in Vietnam, it may not be an economical option compared to other nations, though Vietnamese always welcome international guesses. Do you think that Vietnam population is too crowded? How’s about your country’s? Share some of your thoughts here. We’d love to hear from you!